Art Deco, also called style moderne, is a decorative arts and architecture movement that originated in the 1920s and developed into a distinctive style in western Europe and the United States during the 1930s. Its name derives from the Exposition Internationale des Arts Décoratifs et Industriels Modernes, held in Paris in 1925, where the style was first exhibited. However, the eclectic styles that characterise Art Deco had already appeared in Paris and Brussels before the first World War. After the first World War, American workers endured monotonous assembly lines and harsh conditions. This fuelled a desire for escapism. A culture of consumerism emerged and Americans indulged in new technology such as automobiles, movies and radios to occupy their leisure time and homes. These technologies helped connect people throughout the nation and spread fashionable trends, such as Charleston, flapper dresses, and modern jazz. The spirit of the roaring 20s was reflected in its decorative style – Art Deco. Art Deco was not a single style, but a fusion of different and sometimes contradictory styles, such as cubism. 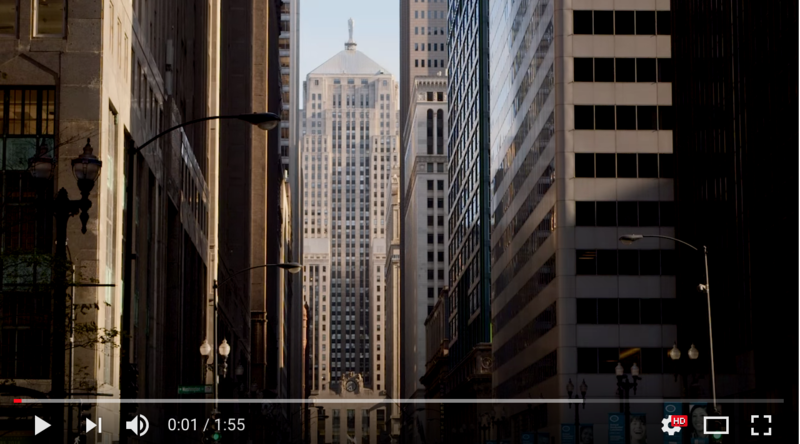 American skyscrapers built during the 1920s and 1930s marked the summit of the Art Deco style and became the tallest and most recognisable modern buildings in the world. Outside of architecture, Art Deco artists created work that embodied the modernist ideas of progress, post-war optimism and a luxurious lifestyle. 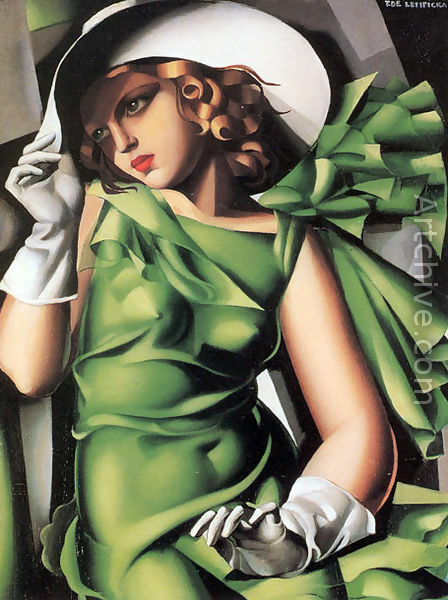 Tamara de Lempicka painted portraits of Parisian socialites and exiled nobility and was critically acclaimed for her unique style, drawing inspiration from cubism. Romain de Tirtoff, otherwise known as Erté became one of the most influential fashion designers and illustrators in Paris. Young Lady with Glove by Tamara de Lempicka. The Art Deco movement was closely associated with the rise in status of decorative artists, who until late in the 19th century had merely been regarded as artisans. The invention of the term “arts décoratifs” in 1875 gave designers of furniture and textiles an official status. The Société des artistes décorateurs (Society of decorative artists), or SAD, was founded in 1901, and decorative artists were finally granted the same rights of authorship as painters and sculptors. The avant-garde sculptors of the time also had an enormous influence on the vibrant Art Deco style. Taking inspiration from the artistic movements of that period, such as Fauvism, Cubism, Futurism, Dadaism, Surrealism and Bauhaus, the sculptors Demétre Chiparus, Joseph Lorenzl and glassmaker Rene Lalique became iconic influencers of the era. Demétre Haralamb Chiparus (16 September 1886 – 22 January 1947) was a Romanian Art Deco sculptor who lived and worked in Paris, France. He is recognised as one of the most important designers of Art Deco sculpture. The early sculptures of Chiparus were created in the realistic style with a combination of bronze and ivory, called chryselephantine, creating an aesthetic effect. Common figurines were long, slender dancers of the Russian Ballet, French theatre and film. Chiparus created one of the most iconic bronzes in 1928 called “Danseuse au cerceau” or “Ring Dancer” inspired by the famous dancer Zoula de Boncza of the Parisian “Folies Bergere”, a first dancer of The Belgrado Royal Opera and a Mime dancer of “l’Opéra-Comique” in Paris. He was also influenced by an interest in Egyptology. A beautiful and rare example of Demetre Chiparus art deco sculpture, dated c.1925. This elegant piece, features a bronze figure of a dancer with a hoop and is signed Chiparus on the marble base. Austrian sculptor and ceramicist, Josef Lorenzl (1 September 1892 – 15 August 1950) was a contemporary of Demétre Chiparus and equally talented. His bronze statues epitomise the Art Deco era. 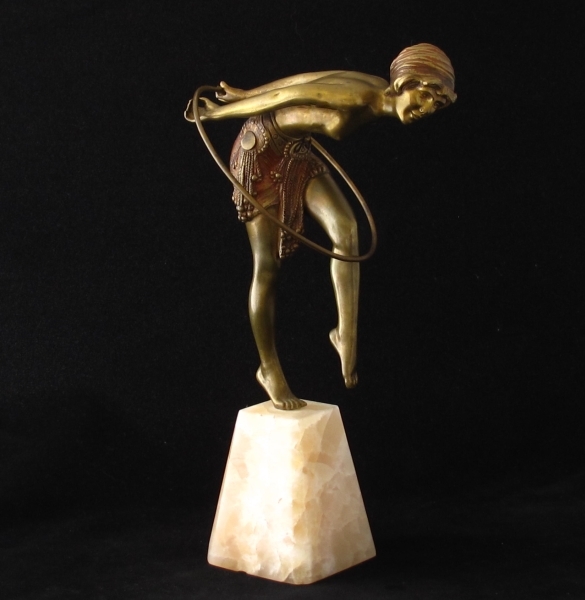 Like Chiparus, Lorenzl was inspired by the female form and he used techniques of bronze casting to represent their beauty and vitality. 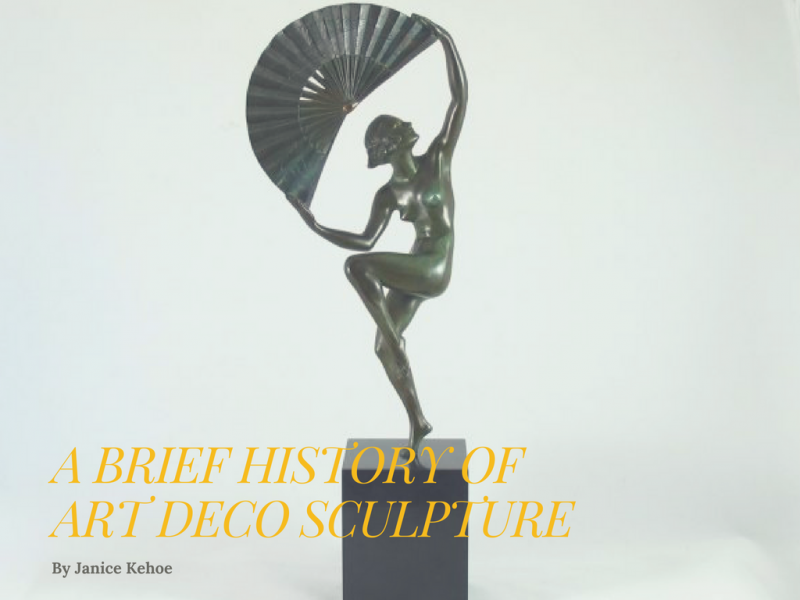 His sculptures are famed for depicting shapely dancers with long, elegant limbs and closed eyes. The majority of Lorenzl’s figurines rest on Brazilian green onyx plinths. 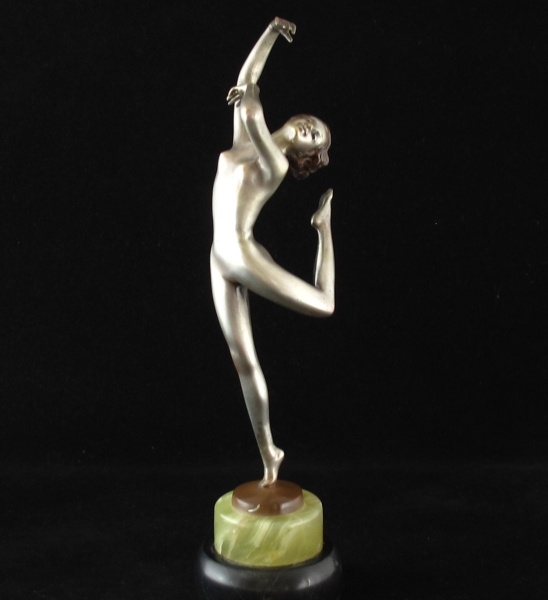 An elegant example of a French Art Deco cold painted bronze figure of a dancer by Josef Lorenzl, dated c 1925. 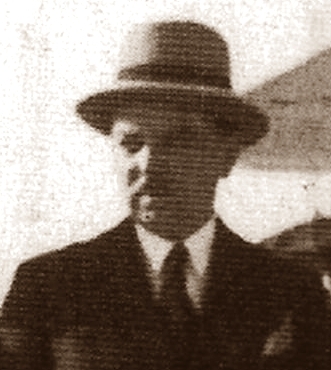 In 1925 at the height of the art deco era, René Lalique was the most celebrated glassmaker in the world. Lalique left his contemporaries behind as he diversified from creating unique jewellery and objects d’art, to the mass production of innovative and usable art glass. He brought glass into the home of everyday people and worked out the industrial techniques to mass produce useful art glass objects to complement the rise of industrial revolution, resulting in global appeal. 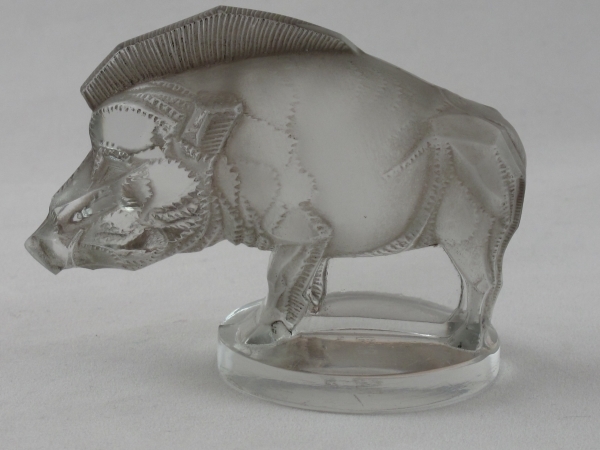 A very fine frosted Rene Lalique glass car mascot modeled as a standing wild boar (Sanglier) heightened with grey staining and hand finished with excellent surface detail, signed R Lalique France twice c. 1929. The dominance of Art Deco ended with the beginning of the second World War as more functional styles began to emerge. In the 1980s there was a renewed interest in Art Deco, where its association with film noir and 1930s glamour led to its use in advertisements for jewellery and fashion. Art Deco’s popularity continues today with its timeless, contemporary appeal. You can browse our site for more examples of iconic Art Deco sculpture and decorative items.